Today is Thanksgiving day in Canada. There are so many people I am thankful for in my development in employee engagement. I offer this post to both acknowledge these people and to encourage you to think about who helped you be where you are. It is almost impossible not to be engaged when we approach our work with a strong sense of gratitude for the other people in our life who make our work possible. Susan Gerlach is my wife. We have grown together, produced 3 children and she is not only a terrific sounding board for my work she offers insightful and critical input. She also flies around the world with me as I speak and teach on employee engagement. Without her accompaniment, my work might be just a job and not a journey. Jack Zinger, Katharine Zinger, and Luke Zinger are my three children and they have each helped me with projects. They also give me insight and perspective on work for young people in their 20’s. John Junson is a pal going back to junior high. He is a brilliant designer and cartoonist. He brings humor and perspective to my work. He encourages new initiatives and my websites, books and work would not be what they are without John. I look forward to his fresh weekly cartoon on work. Peter Dyck has been a client, a mentor and a friend for many years now. He has taught me to flock with eagles! His belief in my work has been a great launching pad for my orbit into engagement. Peter is married to Aganetha Dyck, and her art work with bees, has helped me to think differently inside the hive. Peter Hart has transformed from a connection into a friend and we wrote People Artistry together. He is a people artist who has taught me about the nobility of recognition and engagement. His support means much to me. David MacLeod has done fantastic work in the UK on employee engagement. He hosted both my wife and myself in his home and his caring and work has been inspirational about employee engagement. Gail Pischak and Jean-Francois Hivon connected with me originally to become very “Crucial” in my work and teaching Crucial Conversations, Crucial Accountability, and The Influencer. I learned a lot from each of them and learned a lot from teaching these courses. Gail keeps the rocks alive in my work and Jean-Francois added juice to what I do. Geoff Ronaldson invited me to South Africa to present on employee engagement. He was a fantastic host and gave me a view of engagement in platinum smelters on the other side of the world. Siddhesh Bhobe was a connection in Pune India. His work on gamification and his wonderful hosting is inspirational. He gave me an inside look at the challenges of engagement in the IT sector in India. Lisa Haneberg, Rosa Say, Steve Roesler, and Phil Gerbyshak have all been blogging on management, leadership and work long before most people knew what it was and I have been enriched by my association with each of them. Scott H. Young is a young blogger who I have known just out of high school and he embodies his work about learning on steroids. He fuses learning with both business and blogging in truly creative and helpful ways. The 6400 members of the Employee Engagement Network. Each person who has joined, supported or contributed to the Employee Engagement Network has strengthened my views of engagement. There are so many others and I will be thinking much about them and my gratitude today. Who are you thankful for? 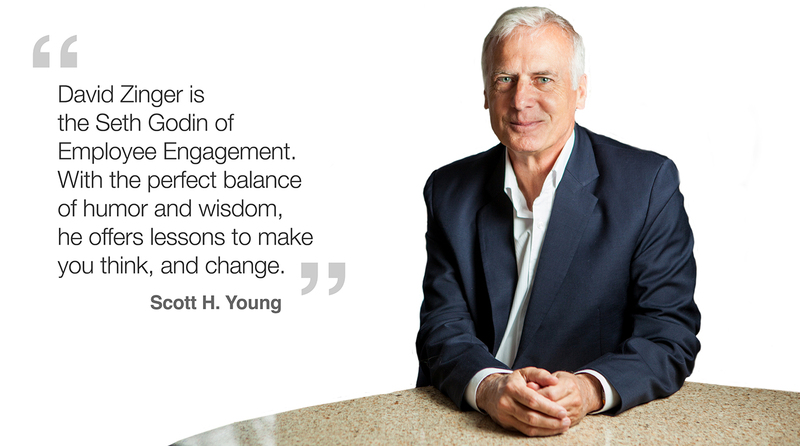 David Zinger is an employee engagement speaker, educator, and expert. Who is both thankful and indebted to so many people who have contributed to his development and perspective on work. Cartoonist, digital designer, and friend, John Junson, has completed four hundred cartoons on employee engagement on the 6300 member Employee Engagement Network. He literally adds a huge burst of color to work and engagement. John just keeps getting better and better. Thanks for showing us the lighter side of work John! David Zinger is an employee engagement speaker and expert who founded and hosts the 6200 member Employee Engagement Network. I am personally and professionally moving to a more declarative approach to work and engagement based on small, simple, significant, and sustainable actions. I will leave big programs and initiatives to others. I want engagement now. I think we have undermined the value and sustainability of good people doing good work for good organizations in our search for excellence and constant striving for greatness. My proposal is not a moon shot but I do believe we can reach new heights in engagement with one small step by individuals translating to one giant leap for engagement and organizations. Strong Employee Engagement = Small Steps + Good Work. A new simplified design of my site: www.davidzinger.com. This will keep being improved over the next six weeks. I encourage you to take a tour and let me know what you think of some of our first steps. Shorter yet more frequent and powerful blog posts. Powerful keynotes and courses based on small, simple, significant and sustainable actions based on the pyramid of employee engagement. Meaningful coaching for engagement for HR professional and other managers/leaders wanting to improve engagement. I want to strengthen each client while multiplying the strength of one with the power of many in their organizations. Fundamentally we change engagement with work one person at a time so I will offer coaching for individuals (leaders, managers, employees, or self-employed individuals) wanting to improve their own career and work engagement. 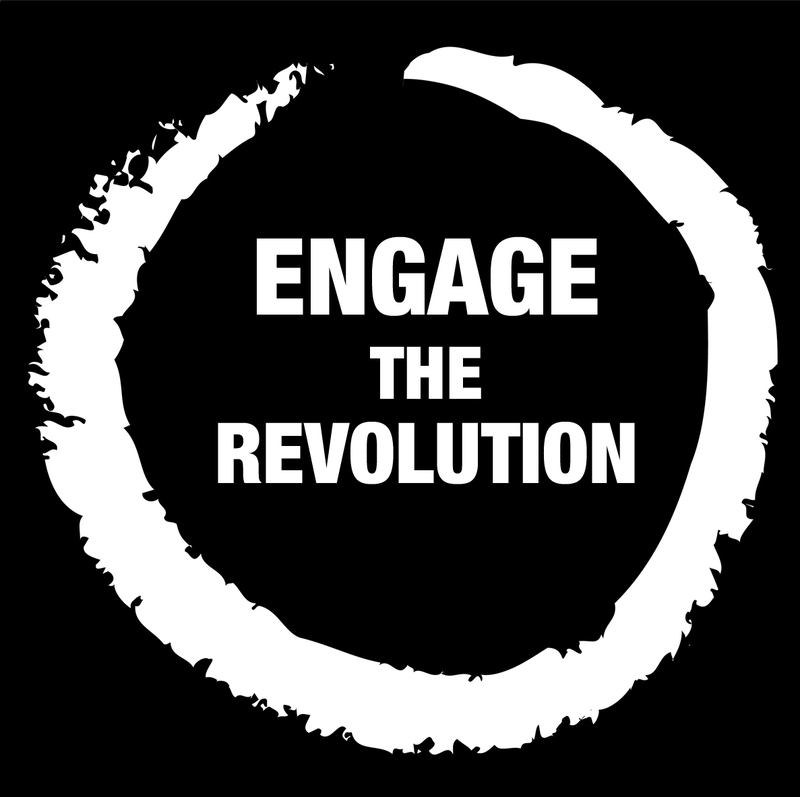 A powerful new course on work engagement fusing the themes of small, simple, strong, significant, and sustainable actions aligned the 10 block pyramid of engagement will be unveiled in February of 2014. After all, full work engagement is less than 10 blocks away. The course can be taken independently through 12 short modules once a week or once a month or it can be delivered as a half day or full day workshop for managers and leaders. Engage along with me, the best is yet to be. I will slowly change my language from employee engagement to work engagement as engagement resides in the task, the context, others, and the organization. To me, it is less about being an employee and more about engaging with your work, your organization, with your co-workers, and with customers. A sincere thank you to John Junson for all the work he has done on my work. We go back to grade nine at Bruce Junior High in Winnipeg and I know that my work would not be what it is without his efforts, influence, and perspective. His weekly cartoons on the employee engagement reminds me that “angels can fly because they take themselves lightly.” I also appreciate my “brand” new relationship with Shawn Phelps, she offered fresh eyes, strong suggestions, and a new buzz with engagement and honeybees. Let’s get small and significant with engagement right now and change work for the better for everyone! Go ahead and ask yourself: What is one small thing I can do right now to improve my own engagement with work or increase the engagement of another person? We have created a new e-book on the Employee Engagement Network with over 50 authors and lots of great ideas to take small and significant steps to improve employee engagement. To open or download the book click on the cover or the following link: Small Engagements Ebook. David Zinger is founder and host of the 5600 member Employee Engagement Network. He uses the Pyramid of Employee Engagement to help organizations and individuals increase employee engagement by demonstrating that full employee engagement is never more than 10 blocks away. Join the Employee Engagement Network Before July 21! Reach out to over 4960 members. 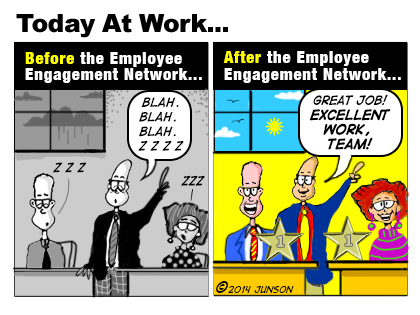 Laugh at the new weekly employee engagement cartoon! John Junson is the network cartoonist and designer. He created the design and colors for the network. He created our unique symbol/brand. He designed all the free e-books. He has been involved in this work before it went online over four years ago. His birthday is July 21 and I want to see if we can have the community at 5000 members for his birthday. Engage along with me to give John 5000 “gifts” for his birthday. Please help. If you have not joined, join today. If you are a member and appreciate the resources and people encourage someone else to join. Membership is both free and freeing. To join the network, click here.